Carrot And Beetroot Sandwich recipe by Nazia Nazar at DesiRecipes.com. A crunchy veg sandwich to complete a healthy meal. Mash the peas and mix with rest of the ingredients. Spread the bread slices with peas spread. 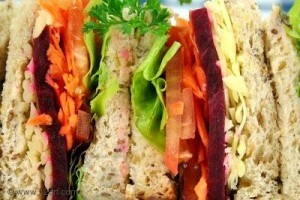 Sandwich two slices with grated carrot and beet root. Make four sandwiches and cut each into two parts.